Steel reinforcing bars of various diameters, patterns and steel grades used for reinforcing concrete. Steel reinforcing bars for concrete that are manufactured with deformations on the surface that aid in creating a bond between the bar and the concrete. In addition the various patterns can be a guide for inspectors and others in identifying the grade of the bars. Bars that are made with this process have a core of high grade steel for strength while retaining an outer ring of more ductile steel for ease of bending and welding. Concrete rebar: Installation of steel for a suspended slab. Unlike the wrought iron bolts and straps as used by medieval builders, modern rebar is fully embedded into the concrete mass. Rebar in it's smaller diameter sizes leaves the steel rolling mills and is transported to smaller regional retail factories in rolls. Larger diameter bars are transported in straight lengths. 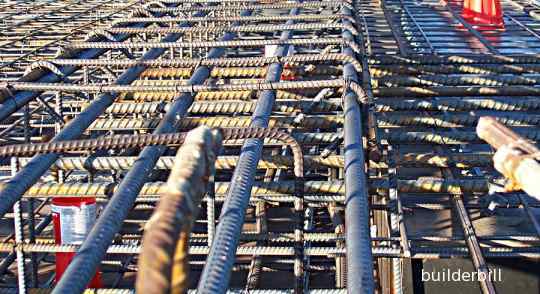 Unlike the old reinforcing bars, modern rebar provides surfaces that can be easily gripped and be firmly embedded into the mass of the concrete. The bars in the photo above are of a type known as Tempcore. Plain round bars are still used but mainly in positions where their shape (say ligatures or in weldmesh) restrains their ability to slip. For the most part lengths of bar are joined by overlapping the straight lengths and tying them with wire. The amount of the overlap is governed by various factors that are taken into consideration by the structural engineer, and somewhere on the drawings or in the specifications will the minimum overlap required for the various diameter bars used on the job. Alternatively a national standard will be cited. there are quite a few different grades and categories of rebar available and attention should be paid to the drawing and specifications to make sure that the correct material is used. Reinforcing steel should be kept clean and free from contaminants. A moderate amount of surface rust is acceptable as it does not affect the bonding of the cement to the steel. Concrete rebar cut, bent, bundled and tagged. The tags in conjunction with a schedule and the drawings tell the steel fixers the position of the steel. All retail rebar outlets provide a full package of taking off the rebar quantities from the job documentation and the supply and delivery of the cut and bent steel to the work site.